We were honored to supply the sound system for the National Day of Prayer event in Downtown Columbus on Thursday, May 5th. 6 Choir mics, 5 wireless mics covered all of the singing for the evening. We are able to mic the drums, and mix in all the instruments for a balanced and musical sound to fill Frankfurt Square. 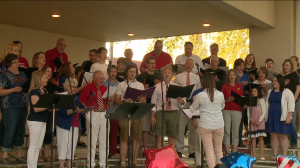 COLUMBUS – Frankfort Square was filled Thursday evening as many in the area came out to commemorate the National Day of Prayer. A choir and a band were on hand to praise the Lord and to give the event a musical atmosphere. The celebration also featured several speakers including Bill Williams who spoke passionately about his project that takes veterans to the war memorials in Washington D.C. The National Day of Prayer was started by Congress in 1952 for among many reasons to “mobilize the Christian community to intercede for America’s leaders and families.” Organizer Mike Oglevie says it was a perfect evening to do just that. “Allows people to come out here and give praises to our creator and determine in your heart that you’re going to continue to pray for your country. What more could we do better than to do this on a night like this,” says Oglevie. The event has grown since 9/11 occurred in 2001 and it is an event meant to gather Christians of all sects. In fact, around seven different churches were represented in the choir. Organizer Moni Albracht says the celebration brings people from every church in Columbus to Frankfort Square. “It breaks down the barriers of all the churches in town, it bring everybody together. We’re all just a bunch of Christians praising God,” says Albracht. The event was closed with final hymns from the choir and the removal of the American flag. ← New World Singers Dinner Show!